The temperature dropped 40 degrees Saturday (sniff), and the shock to the system rebooted my brain to fall. Despite the continued availability of fresh fruit, the season makes me crave the cooked variety–with the flavor and taste of the sun concentrated to supple softness, accented with warm spices and featured in stick-to-the-bones desserts. Top of my list in this genre this time of the year will always be the tarte tatin–a simple, beautiful, French upside-down tart (or cake) that traditionally showcases apples and is equally comfortable on the brunch or dinner table. But I am in cleaning-out-the refrgerator mode. Instead of apples, I had a quart of fabulous black plums and a few leftover pluots that I scored at the farmers’ market last week. 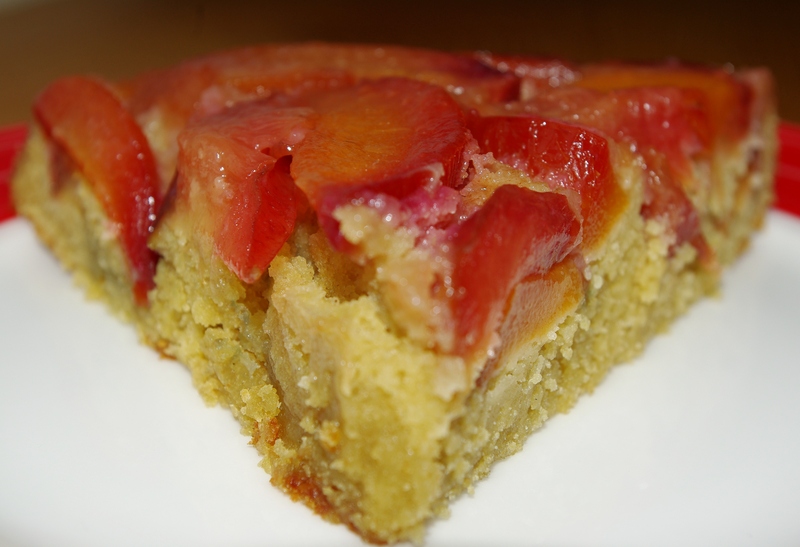 So, I created a plum-pluot riff on the tarte tatin, using up the fruit in my fridge as well as the leftover buttermilk and some gluten-free flour (part of the food cache I inherited when Sophie moved overseas). As with the traditional tarte, I began by caramelizing the fresh fruit, peels on, in butter and sugar–producing a glorious fruity, red caramel. Then, I whipped up a tangy, nutty batter laced with ginger and cardamom to cover the fruit–using the same, oven-safe skillet I had cooked it in. Did I mention how simple this is? Just 45 short minutes later, the browned cake was out of the oven and, slightly cooled, flipped onto a large cake plate, glorious and red. We ate the first slices still hot and a little gooey–and it was divine this morning for breakfast. While the apple version is marvelous and definitely worth a place in the repertoire, this is a show stopper. And, I’d say, tastier.